Nicknamed “The Black Pearl,” this was established around 1934 as an oceanfront community for blacks denied access to other area beaches because of segregation laws. 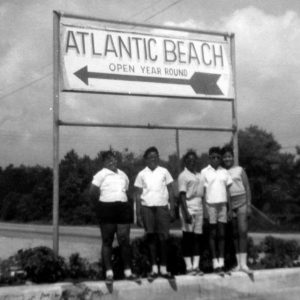 The area was one of the most popular beach resorts on the East Coast for blacks from Virginia to Florida. Its hotels, nightclubs, restaurants, shops, and pavilion were packed every May to September. As other area beaches began desegregating in the 1970s the beach saw fewer visitors. The town of Atlantic Beach, chartered in 1966, is one of a few black-owned and governed oceanfront communities in the United States. Marker erected by the Atlantic Beach Historical Society, 2005.